Please read this Policy as it includes important information regarding your Personal Data and other information. Capitalized terms not defined in this Policy shall have the meanings given to such terms in the Terms of Service. If you have any questions or concerns, please do not hesitate to contact us at: admin@atcincometax.com. (a) Personal Data. Personal Data and other information are collected from you when you disclose Personal Data or other information to us or third parties when using the Services. “Personal Data” means any information that may be used to identify an individual. Personal Data does not include aggregate information. To use certain aspects of our Services you may be asked to provide us the following Personal Data: full name, email address, payment information (if applicable), and information required for tax return preparation Services (if applicable). (d) Log Information. When you browse our Services, you do so anonymously, unless you have previously visited the Website. However, we may log your IP address to give us an idea of which part of our Services you visit and how long you spend there. However, we do not link your IP address to any Personal Data unless you have logged into our Services. Also, our Services may use a standard technology called a ‘cookie’ to collect information about how you interact with our Services. Please see Section 7 below for more information. (a) When you have enabled us to share your Personal Data with another company or our Affiliates, such as: in sending you offers and promotions about their products and services; or allowing us to share your personal data with third parties or Linked Sites, such as Social Media Profiles. Once we share your Personal Data with another company, the information received by the other company becomes subject to the other company’s privacy practices. (d) You may opt out of targeted advertisements from some third party companies by visiting the Network Advertising Initiative or Digital Advertising Alliance Consumer Choice Page, which provide simple ways to opt out of ad targeting from participating third party companies. When you opt out, your selection will be stored in a cookie that is specific to your Device or computer and the web browser you are using. The opt-out cookie has an expiration date of five years. If you delete the cookies on your computer or Device, you will need to opt out again. (e) We will contact you from time to time for marketing purposes. Unless you have opted out, this could include contacting you by phone or email. You may opt-out of receiving marketing communications from us by the following means: (i) contacting us at admin@atcincometax.com; (ii) following the instructions in the communication; or (iii) by mailing the request to us at 3533 Memorial Drive; Decatur, GA 30032. 5. Security of Your Personal Information. We exercise care and prudence in protecting the security of Personal Data provided to us. We carefully protect your data from loss, misuse, unauthorized access or disclosure, alteration, or destruction. Personal Data is stored in password-controlled servers with limited access. WE TAKE THESE PRECAUTIONS IN AN EFFORT TO PROTECT YOUR INFORMATION AGAINST SECURITY BREACHES. HOWEVER, THIS IS NOT A GUARANTEE THAT SUCH INFORMATION MAY NOT BE ACCESSED, DISCLOSED, ALTERED, OR DESTROYED BY BREACH OF SUCH FIREWALLS AND SECURE SERVER SOFTWARE. BY USING THE WEBSITE, YOU ACKNOWLEDGE THAT YOU UNDERSTAND AND AGREE TO ASSUME THESE RISKS. 6. Do Not Track Requests. Our Website does not currently support ‘do not track’ settings on your browser or have any similar mechanism that allows you to opt out of or otherwise control the collection of certain information about your online activities. 8. Compliance with the Children’s Online Privacy Protection Act. We recognize the need to provide further privacy protections with respect to Personal Data we may collect from Children who use our Services. For that reason, we make every effort to comply with the regulations of the Children’s Online Privacy Protection Act of 1998 (at 15 U.S.C. § 6501–6506). We never collect or maintain Personal Data through the Services from those we actually know are under thirteen years of age, and no part of the Services are structured to attract anyone under thirteen years of age. We expressly disclaim, and you expressly release us from, any and all liability whatsoever for any controversies, claims, suits, injuries, harm, loss, penalties, damages, arising from and/or in any way related to any misrepresentations regarding the age of any User. We reserve the right to suspend and/or terminate with or without notice a User’s ability to access the Services if we believe that User has provided false information when registering for and/or using the Services and each User agrees to make no further use of the Services after termination and/or during suspension. 12. Questions or Comments Regarding this Policy. We value your comments and opinions. 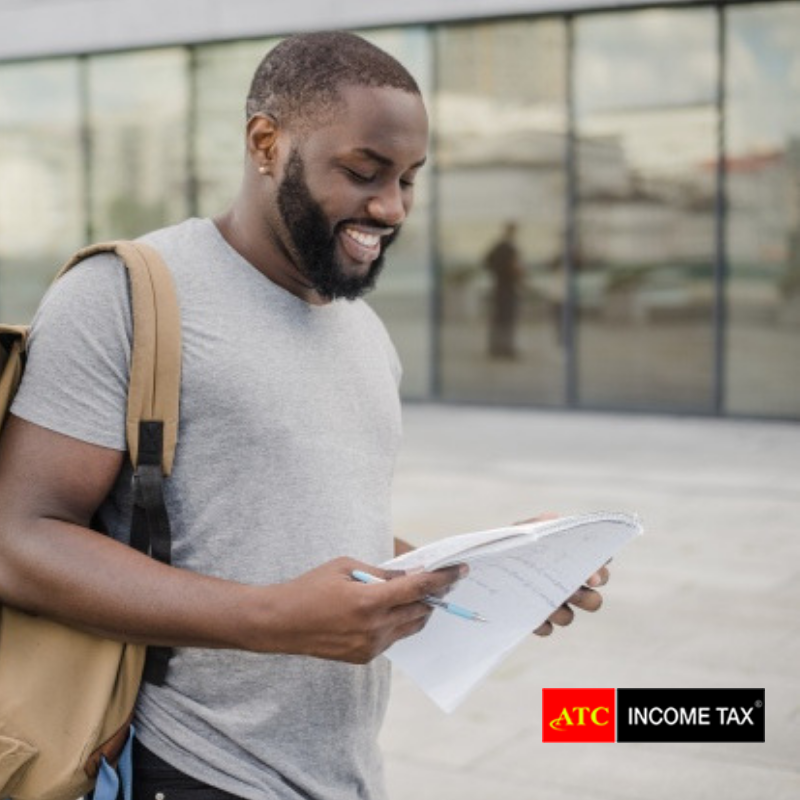 If you have questions, comments or a complaint about compliance with this Policy, you may send a written notice to us at: admin@atcincometax.com or at 3533 Memorial Drive; Decatur, GA 30032.